Rubber Room Ramblings: FREE BIG SHOT PROMOTION CONTINUES!! There is exciting new today!! Stampin' Up! 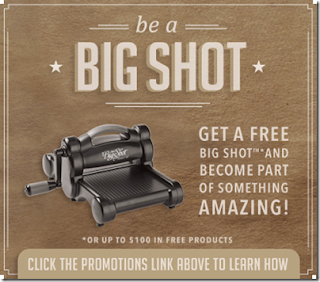 is continuing the FREE BIG SHOT promotion!! Are you still thinking about becoming a Stampin' Up! Demonstrator? Do you want to get a great start on your business with a FREE Big Shot (or $100 in FREE product) added to your Starter Kit? If so, here's some awesome news! Stampin' Up! has extended their promotion for new demonstrators until November 11th. That means you have 11 more days to take advantage of this opportunity to join my Stampin' Up! downline and receive all of the awesome benefits Stampin' Up! demonstrators enjoy every day. Whether you want to become a "hobby demonstrator" or build your own business, this is a great opportunity to take advantage of FREE goodies! Please contact me if you have any questions, or use the link below to find out more information on this great offer! JOIN MY STAMPIN' UP! TEAM HERE!